To attract investment and tourists and to enhance the quality of life of their citizens, municipal authorities are paying considerable attention to the quality of the public domain of their cities – including their urban squares. Politicians find them good places for rallies. Children consider squares to be playgrounds, the elderly as places to catch-up with each other, and for many others squares are simply a place to pause for a moment. 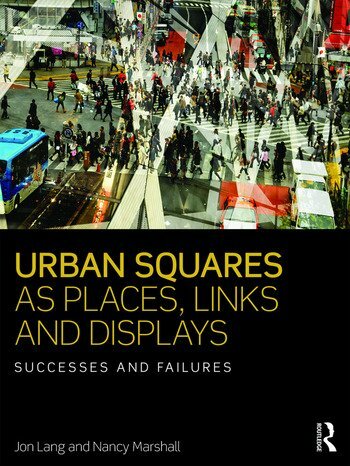 Urban Squares as Places, Links and Displays: Successes and Failures discusses how people experience squares and the nature of the people who use them. It presents a ‘typology of squares’ based on the dimensions of ownership, the square’s instrumental functions, and a series of their basic physical attributes including size, degree of enclosure, configuration and organization of the space within them and finally based on their aesthetic attributes – their meanings. Twenty case studies illustrate what works and what does not work in different cities around the world. It discusses the qualities of lively squares and quieter, more restorative places as well as what contributes to making urban squares less desirable as destinations for the general public. The book closes with the policy implications, stressing the importance and difficulties of designing good public places. Urban Squares offers how-to guidance along with a strong theoretical framework making it ideal for architects, city planners and landscape architects working on the design and upgrade of squares. Jon Lang is an Emeritus Professor at the University of New South Wales in Sydney Australia where he headed the School of Architecture from 1998 to 2004. He is also the director for urban design of ERG/Environmental Research Group Inc. in Philadelphia, Pennsylvania. Born in Kolkata, India he received his early education in that city and in Kalimpong. He has a bachelor’s degree in architecture from the University of the Witwatersrand in Johannesburg and a doctorate from Cornell University in Ithaca, New York. He taught at the University of Pennsylvania from 1970 to 1990, heading its Urban Design Program in the 1980s, before settling in Australia. He has authored books on urban design, architecture in India, the relationship between people and the built environment and on architectural theory. He has served on international urban design juries and worked as a consultant throughout much of Asia as well as the United States and Latin America. He received the Reid and Malik Medal from the Institution of Civil Engineers (UK) in 2011. Nancy Marshall is a Senior Lecturer at the University of New South Wales in Sydney Australia where she was Associate Dean/Education from 2009 to 2013. She has taught theory and practice in the Planning Program there since 2004 and won the UNSW Vice-Chancellor’s Award for Teaching Excellence in 2007. Born and raised in Calgary Canada, she received her undergraduate and postgraduate degrees from the University of Calgary and her PhD from the University of New South Wales. Prior to coming to Australia she worked as a planning consultant in Canada specializing in public involvement in urban planning and design. Her work as a planner at the local government level included efforts to more efficiently deliver high quality parks and civic spaces. She has been greatly involved in the affairs of planning – serving as a national, senior editor of the Canadian Institute of Planning’s journal Plan Canada from 1997 to 2002 and a member of Calgary’s Subdivision and Development Appeal Board from 1994 to 1997. She is currently a corporate member of the Planning Institute of Australia.